This 7-1/2" (19.1 cm) tall pig works just like traditional ketchup and mustard bottles, but this knife-wielding porker can't be filled with any common condiment. This squeezable plastic piggy wants to be filled with your best barbeque sauce. 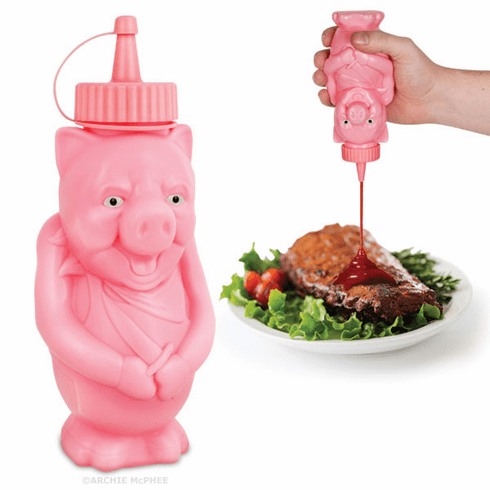 A must have for every grill jockey and savvy smoker sage, the Pig Condiment Bottle will revolutionize the way BBQ sauce is transported from the table to the meat. Holds 12 oz (355 mL) of your favorite sauce.